I love satire. So it comes as no surprise that H. H. Munro (Saki), Waugh and Wodehouse are at the forefront of my shelves. Each is different of course, Waugh is hilariously mean, Wodehouse gentle and Saki downright brutal. But all satirical geniuses of the first water. 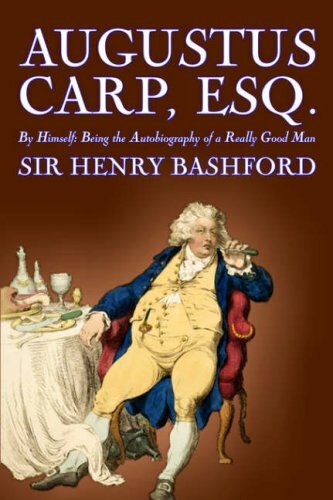 But in his virtually unknown masterpiece, Augustus Carp, Sir Henry Bashford out does them all. And in that company, that’s saying something…. The book was published anonymously in 1924 by physician Henry Bashford. It was a neglected masterpiece for many years until Anthony Burgess singlehandedly got it back into print in 1966. Since that time it has slowly built up a following and the cause has been taken up by some heavyweights like Michael Dirda. No one, that I’ve read, has so effectively skewered the self righteous and hypocritical church goer as does Bashford. I have always wondered what event, or, what person(s) pissed off Sir Henry to the extent that he took the time to write this classic. Obviously it was a private venting, as he published it anonymously. One suspects that the good doctor might have alienated much of his client base had he signed his name to it. Read the reviews, and by all means read the book. You won’t regret it. This entry was posted in Lit and tagged Anthony Burgess, Augustus Carp, Books, Henry Bashford, Literature, Michael Dirda, P. G. Wodehouse, Saki by Sir Edward Percival Fox-Ingleby, Bt. Bookmark the permalink.